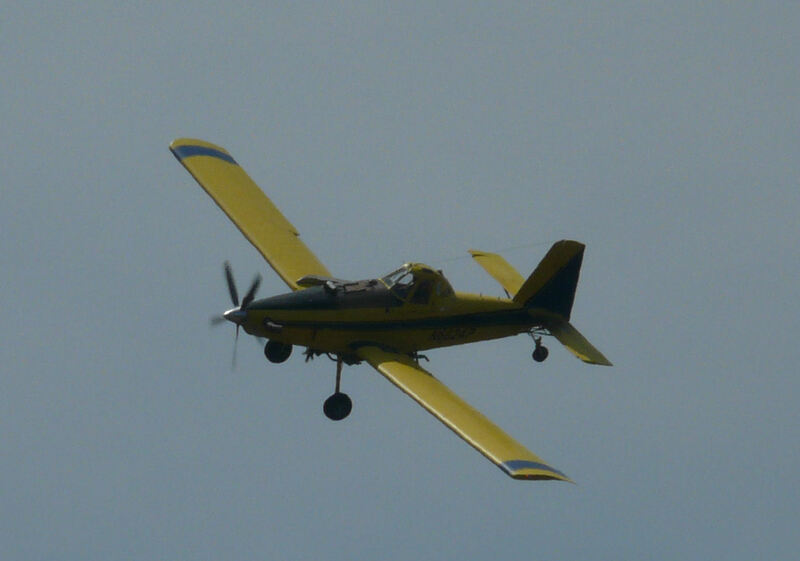 It looks like our neighborhood cropduster has upgraded from an Air Tractor AT-401 to a newer AT-602. The 602 holds 50% more chemicals (630 gallons instead of 400), and has a much more powerful (and louder) 1050 hp Pratt & Whitney PT6A turboprop engine compared to the 401's 600 hp P&W Wasp radial engine. According to the FAA, his old plane was sold to someone in Mexico and has been struck from the registry. The new aircraft is N602AP. The plane was spraying a soybean field on the other side of the trees and occasionally buzzing our house as he turned around to make another pass. You can also hear the goats having a bit of a scuffle in the background.